Challenge Dairy, the largest selling butter brand in the West would like to invite you to enter now for a chance to win A Taste of the West during a 7-day/6-night trip for 4 people to the incredible Mountain Sky Guest Ranch in Montana’s Paradise Valley, just North of Yellowstone National Park. 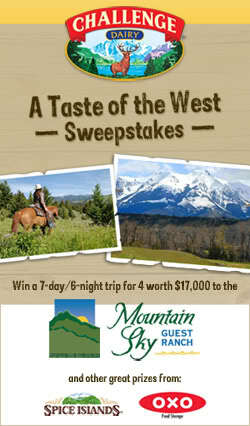 For more information, please visit Challenge Dairy at http://www.challengedairy.com/sweepstakes/index.html. In addition to world-class fine dining, the guest ranch features cozy accommodations, horseback riding, hiking, fishing, rock climbing, clay shooting and much more! Revive, rejuvenate and reconnect with a variety of activities for everyone in this $17,000 luxury getaway. They'll also be churning more good luck with an $850 kitchen package from Spice Islands and OXO.